Hi there fellas, this post will be a little different from all the others, in fact this time I will not bore you with some obscure recipes of mine, nor I will yap about some strange and complicated syrups or shrubs. No, this time I will keep your eyes glued to the screen with a fantastic slideshow of my most recent trip around Eastern Europe.. yes just like in the eighties, it will take just a couple of hours to go through the hundreds of pictures I took.. I am only kidding of course: these posts will cover my six days spent between Ljubljana and Bratislava, focusing on bars and restaurants, to give advice to fellow travelers, since the net is lacking on food blogs for these two beautiful cities. Ljubljana is the capital of Slovenia, a country that was spared the atrocities of the Balkan war, but that had to endure 40 plus years of Socialism and Totalitarian regime. Nowadays Ljubljana is a wonderful city,described by many as the Venice of the Balkans, one of the greenest capitals in Europe, with a very young and very welcoming population. We stayed in an apartment just outside the old town, booked on Airbnb . 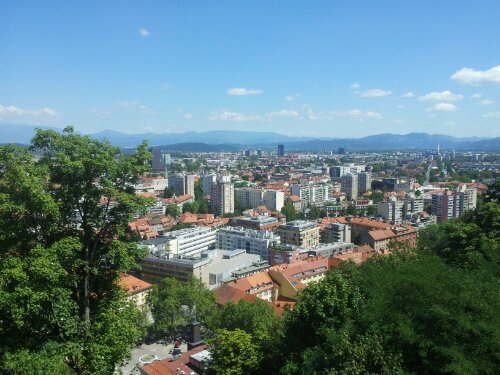 Ljubljana is so small and so well serviced that you don’t need to stay right in downtown,so we chose a small two bedroom apartment in a socialist-era residential area, very quiet and suggestive, and I would recommend to anyone such an arrangement. The old town is of course the main attraction, with its canals and the castle overlooking this miniature Prague (the architect that designed the majority of the buildings is the same that created Prague’s beautiful streets). You can find bars and restaurants on either side of the canals, there’s literally dozens of them, and also a wonderful open-air market, just in front of the Gondola that brings visitors up to Ljubljana Castle. Prices are generally cheap, one pint of beer goes from 90 cents to 2,50 euros, depending on the establishment, and cocktails are around 5 Euros, so not that bad. Food prices are also quite low, but the quality is definitely high. There’s a great choice of quality restaurants, ranging from traditional and local to more modern Italian and French inspired cuisine. Local delicacies and specialties are game, patès ,fresh seafood and of course wine. You order your item from a touch screen device, then wait for the massive guy at the grill to be done cooking your order. 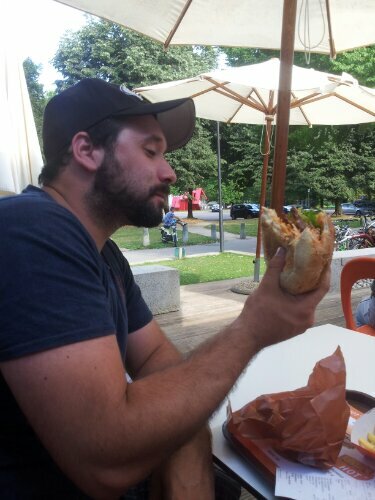 You can choose different dishes and you can also opt for a regular beef burger , but you would be insane to do so.. their horse burger is massive and delicious.. 10 euros buys 2 burgers and beers. The place can be found on the western tip of Tivoli Park, a huge green area completed with trails, fountains and benches, and I must admit, this is one of the best metropolitan park I have ever seen. Another gourmet fast-food place is Klobasarna, located at the foot of the Castle Hill, by the Town Hall. This place is rather small, they have two tables outside and no chairs; their menu is quite spartan as well: you can have either a full portion of traditional sausage, served sliced up on a plate, with bread and horseradish, or a half portion of said sausage, served the same way. Needless to say, these sausages are to die for, and a good snack to give your liver a “rest” while bar-hopping. Ljubljana doesn’t offer a great cocktail scene, don’t expect mixologists with suspenders and newsboy hats, nor dark, speakeasy style watering holes. A good place to have a drink is the bar at Vander Hotel, located in an alley that leads to the main canal. It’s a rather small place, very well stocked and elegant. we had a couple of Dark n’ Stormys, paid 6 euros each for them and left happy. Another great place to stop by for lunch or dinner is Valentin Restavracija. They specialize in fresh seafood, you can walk to the counter and choose any item from the window, decide wether you want it grilled or fried or you can order from one of their two menus: we had grilled trout and “fritto misto”. The quality of the seafood was outstanding, the price incredibly cheap. this place is located just next to the Gondola for the castle, in the same square that hosts the open air market. 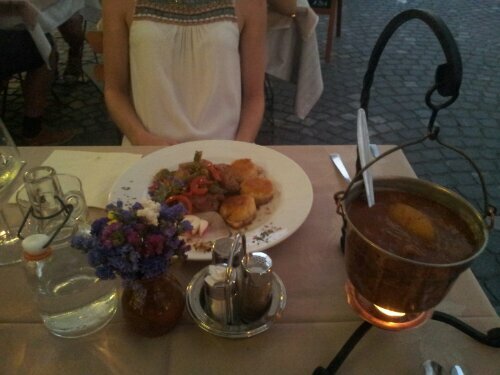 A third really good option for food is the restaurant Gostilna Na Gradu, right in the castle overlooking the whole city. This place is run by three of the best chefs in town, and they offer their modern twist on traditional Slovenian cuisine. p.s. Make sure you visit the countryside as well, especially Bohinj Park and Savica Fall.. if you are into nature, it doesn’t get much better than that. Stay tuned for my review of Bratislava, in the next few days! !